This class is limited to 8 students and there are no refunds or transfers for tuition. This is an introduction course that will teach students how to make a knife in two days and how to use salvaged materials from leaf springs, roller bearings and other qualified steel pieces to make blades. This 2-day class is designed to serve as a basic, hands-on introduction to the craft of bladesmithing. Instruction will include information on tools and equipment, material selection, body mechanics, design considerations, forging techniques, basic heat treating principles and finishing methods. This will be a fairly active class, with strong emphasis on student participation, and will involve a healthy amount of heat, noise, sweat, and physical exertion. Each student will start with a 1/4″x3/4″x6″ segment of high carbon spring steel, and through forging, profiling, beveling, heat treating, and finishing, create their own personal hand-forged blade. 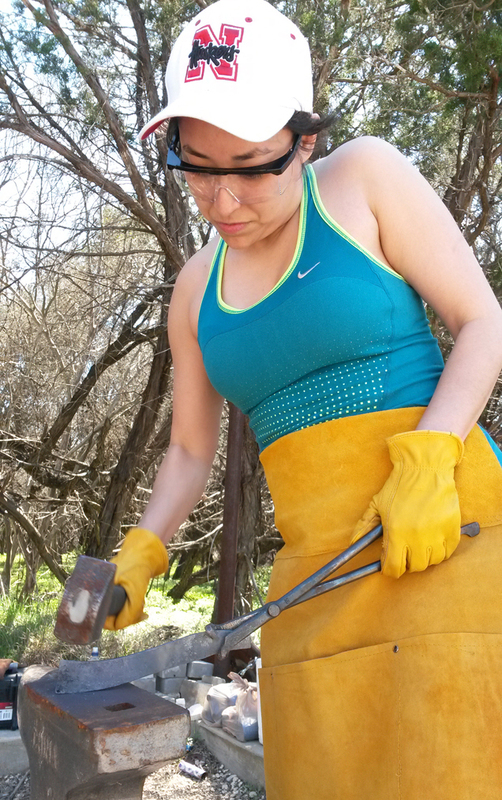 This class will focus on introducing the basics of blacksmithing first. This isn’t just a knife-making class. You’re not just grinding a pattern out and then heat-treating it. Not that there’s anything wrong with that kind of knife-making, but learning to actually blacksmith gives you an entirely different skill set and a huge range of options in working with scrap metals (as in a post-disaster or post-apocalyptic situation) that you can’t reach by simply grinding out a blade pattern. Knives will be forge-finished and if all goes well for you, you will go home with a paracord-handle, finished knife. Additionally you will receive a pair of safety glasses, ear plugs, a file, and a file card to use for the class and take with you. You will actually learn to heat, pound and shape spring steel into a blade. Come prepared to do a lot of hammering. Students will be introduced to metals, heating, forging, hammering techniques, straightening, grinding, shaping, knife and handle making. Don’t have huge expectations for the quality of your first blade. 🙂 It’s pretty ambitious to make a decent blade the very first time you have ever swung a hammer, but you will make one and learn enough to be able to do this on your own, or of course do it again in a more advanced class with more information and techniques next time. Dates: February 23 – 24th, 9 am – 4 pm. Location: Directions will be emailed to all registered students in advance.